Get ready for a galactic good time! Climb into a "spaceship" and blast off to the asteroid belt and Jupiter. 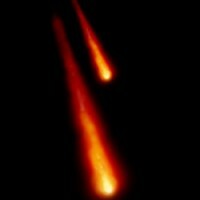 Find out all about comets. Determine the positioning of asteroid belts and comets. Create your own solar system and more. Join us for special hands-on activities. Sponsored by Woodward: Aqua-Aerobic Systems; Kiwanis Club of Rockford; and the Kjellstrom Foundation of CFNIL. Admission is FREE to Members; $10 Public.